HOLIDAY MEALS pose a special challenge—as much psychological as physical—to people with diabetes. We all love the calorie– and fat-rich traditional favorites and our dinner guests probably expect to see them on the table. As gracious hosts, we don’t want to deprive them or ourselves of the once-a-year treats. Here are a few recipes that are perfect for a delicious, diabetes- friendly holiday dinner from the Diabetes Menu Cookbook. 1 boneless center-cut pork loin (3 1/2 to 4 lbs. □ Preheat oven to 350 degrees F.
□ Put the pork loin on a rack in a shallow roasting pan. Brush the meat with olive oil and then sprinkle it with salt, pepper and rosemary. Pour the wine and water into a roasting pan. Roast for 1 hour. □ Remove the pan from the oven and spoon 1/2 cup of pan drippings into a small bowl. Add the marmalade and mix well. Pour this mixture over the meat and return it to the oven. □ Continue roasting the meat for 35 to 45 minutes, basting it 2 to 3 times with pan drippings, until a meat thermometer shows 160 degrees F.
□ Let meat rests for 15 minutes before serving. leeks and brush each thigh with mustard mixture. Bake the chicken, basting occasionally, until it is cooked through and juices run clear, about 50 minutes. Per Serving: Calories—394; fat—23.7g; calories from fat—54%; saturated fat—5.6g; sodium—535mg; cholesterol—145mg; protein—40.1g; carbohydrate—2.8g; iron—2.62mg. □ Preheat oven to 375 degrees F.
□ Wrap beets tightly in foil to make 2 packages (3 beets in each) and roast until tender, about 1 1/4 hours. □ Carefully unwrapped the beets and, when just cool enough to handle, slip off the skin and remove the stems. Cut beets into 1/4 inch rounds and transfer into a bowl. Add 1 tablespoon of the walnut oil to the beets. □ Separate the endive leaves. Arrange them on a platter or divide among 6 plates. Drizzle endive with another tablespoon of the oil. Spoon the beets over the endive and sprinkle with the cheese and walnuts. Drizzle salad with the oil and add some additional pepper if desired. Per Serving: Calories—230; fat—5g; saturated fat—0.6g; calories from fat—46; sodium—449mg; protein—1g; carbohydrate—5g; vitamin C—12mg; potassium—710mg. sodium—308mg; cholesterol—153mg; protein—55g; carbohydrates—5g; potassium—879mg. □ Pat chicken pieces dry and season with salt and pepper. In large skillet or sauté pan, heat 2 tablespoons of olive oil and cook the chicken over medium heat until lightly browned, about 3 minutes per side. 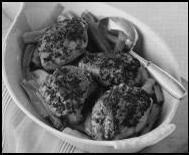 Using a slotted spoon, transfer chicken to a bowl. Pour off all oil and wipe the pan clean with paper towels. □ Heat remaining tablespoon of olive oil in the pan and add the leeks. □ Cook over medium heat, stirring until coated. Add 1/2 cup of the broth, bring to a boil, reduce the heat and simmer until the leeks are just tender, about 5 to 7 minutes. □ In a small bowl, mix the mustard and vinegar together.